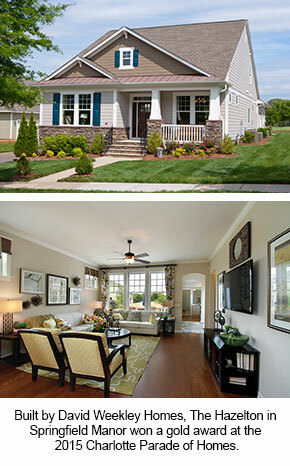 Charlotte, NC (October 14, 2015): David Weekley Homes is proud to add two more homes to its prestigious list of award-winning floor plans after collecting two awards from the 2015 Charlotte Parade of Homes. Hosted by the Home Builders Association of Charlotte, Weekley featured nine homes in this year’s annual event, winning the gold award in the $700,000-$800,000 category for The Hazelton in Springfield Manor and the silver award in the $300,000-$350,000 category for The Infinity in Eagle Park. Hosted by the Home Builders Association of Charlotte, this year’s Parade of Homes concludes October 16-18, with each home on the tour being open from 10 a.m. to 6 p.m. on Fridays and Saturdays, and from 1 to 6 p.m. on Sundays. 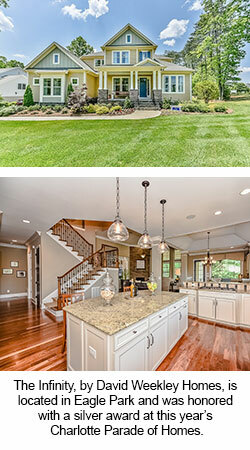 The Weekley homes featured include offerings from the mid $300s to $1 million+, across such areas as SouthPark, the Marvin area, Belmont, Harrisburg and more.